Ios Greece does not have an airport so you can only arrive here by ferry. 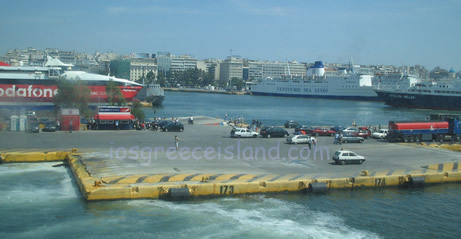 The island has connections by ferry to many other Greek islands and also to the mainland. On this page I will guide you to some of the ways that you can travel to Ios. The easiest destination in Greece to find flights to is Athens. You will find many different flights from all over the world and they land on the new Athens International Airport also called Eleftherios Venizelos. From there you can take the bus, number X96, to the port of Piraeus where you will find daily ferries to Ios. You can also take the bus to Rafina from the airport for other ferries to Ios from Athens. 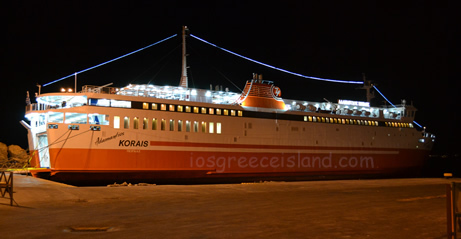 The boat from Athens to Ios takes between 3h 30min with a high speed boat and up to 9h with a conventional ferry. The price is about double with the high-speed and most of the time not worth it. The travel time on the slower ferries is relaxing, sit outdoor on the deck and meet new people. You can also start drinking on the ride, especially if you arrive in Ios around midnight. Then you can just leave your luggage at the hotel when you get there and head straight out into the nightlife of Ios. You can also find cheap flights to the different islands of Greece and take the ferry to Ios from there. One island close to Ios is Santorini and it has its own airport so you can book flights landing on this island. This airport is very small and can only serve 6 aircraft’s at a time. So it can be harder to find flights here from around the world. One alternative can be to fly to Athens and then take a connecting flight to Santorini. You can then take either the bus or a taxi from the airport to the port as it is not that far away. 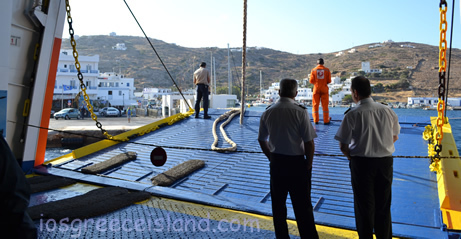 The ferries from Santorini to Ios take between 40min and 1.5h depending on how you travel. You can also travel to Ios from many other Greek islands. Some that are close by and have daily connections to Ios include Naxos between 45min and 2h away by ferry. If you travel from Paros then it will take between 1h 30min and 3h and from Mykonos you can get to Ios in 2h 30min. You can also travel here from Crete but normally not directly but with a change of ferry at Santorini or another larger Greek island. So it is a bit hard to travel to Ios Greece but it is definitely worth the trip and you are going to have the holiday of your life if you visit this island.